The blade of Kiritsuke knives has a different shape to normal Western knives. It is angular shape around the tip and straight line on the spine. This design is originated from rectangular Usuba knives and pointed Yanagiba Knives. With having both advantages of wide blade Usuba and pointed tip Yanagiba, this hybrid knife works as multi-purpose knife. Besides, by having the angular shape the tip has a smaller angle which is good for some meticulous tasks using a tip. Kiritsuke knives have become popular because of its aesthetic and functional aspects. It is double bevel blade and has the same cutting pattern as normal Western knives. 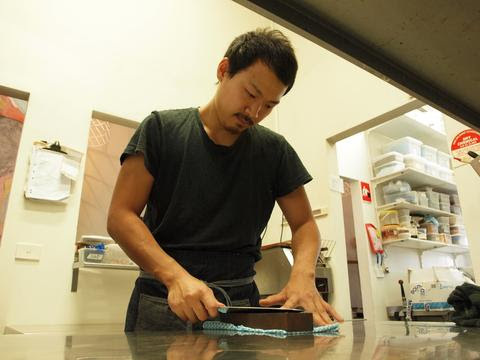 "I have tried all knives at Kaz’s, both cutting in the kitchen and sharpening on a whetstone. I found all of them are joy to use. However, this Ginsan kiritsuke is special. First of all, it is very comfortable to use. The one I use (Gyuto 23cm) has lovely weight and easy grip that makes my prep really easy. The sharpness exceeds my VG10 Damascus Gyuto and it’s got ultimate sharpness after #12000 whetstone. I think this level of sharpness is not achieved by VG10 steel but Ginsanko (silver-3 steel). According to the specification of Ginsanko, it contains Carbon 1.05%, Chromium 13%, Manganese 0.8%, Rockwell Hardness 59-62HRC. Frankly, Ginsan knives got very similar hardness and sharpness to Carbon steel knives. It is the best stainless knife I’ve ever used! In fact, Ginsan knives are widely used by professional Japanese cuisine chefs in Japan. If you are looking at the superlative sharpness in a stainless chef’s knife, this is absolutely the choice. Try one!" What is "Ginsan" Silver-3 Steel Gyuto Knives? Gyuto knife “Ginsan” series utilises Rust resistant Silver-3 Steel. (Ginsan is translated as Gin=Silver, San=Three) This model’s sharpness is comparable to carbon steel knives and is strong to rust. It’s suited for those who prefer knives with great sharpness as well as effortless maintenance. High grade material ”Ginsan” is originated from Yasuki Hagane commercialised by Hitachi Metals,Ltd. This over 1000 year-traditional ironmaking method is called Tatara, which refines iron sand into Tamahagane (mostly used in sword blades). These days, “Ginsan” is commonly used in high grade cutlery products and preferred by a number of professional chefs. It contains more than 12% of Chromium that makes superb sharpness and durability. It is comparable to some high grade carbon steels such as Blue steel and white steel but far more rust resistant. Manufactured by Hitachi Metals,Ltd. Contains Carbon 1.05%, Chromium 13%, Manganese 0.8%, Rockwell Hardness 59-62 HRC. Highest quality stainless steel with similar characteristics to carbon steel. Made from very pure, fine particle components. Ensures best performance among other stainless steel knives. Plywood handle is mostly used in professional chef knives. It is easy grip and reduces fatigue when holding long hours. Bolster shuts out water coming inside which causes damage on the handle. It also gives good weight balance of blade and handle.